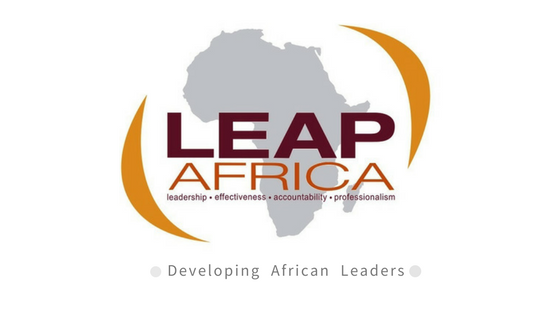 Leadership Effectiveness, Accountability and Professionalism (LEAP) Africa, established in 2002, is a non-profit committed to developing dynamic innovative and principled African leaders. We recognize that raising leaders is critical to nation building and wealth creation. Over the years, LEAP has inspired and equipped youth, business owners and social entrepreneurs to lead ethically while implementing initiatives that transform their communities and organizations for better; sustaining livelihood and contributing to national development. LEAP achieves this through its training programmes, publications and most recently eLearning. LEAP actively contributes to the body of knowledge on how to build a sustainable organisation in our local business environment. Extensive research forms the basis for our books and leadership training curricula and our books are action-oriented guides to creating positive and lasting change in individuals, organisations and communities. To date, LEAP has published 11 books on topics such as ethics, governance, talent management, succession planning and corporate culture. Our most recent publication, The Art of Managing Risk was launched in June, 2015 at our annual gathering of SMEs. Our focus is captured under three headers: 1. Youth LEAP 2. Biz LEAP 3. eLEAP Kindly visit www.leapafrica.org to find out more. Has Technology Stolen our Jobs or Made New Ones? Recently at the office, we had a brainstorming session on how best our nonprofit can serve beneficiaries using technology. This resulted in an intense conversation about the possibilities of employees losing their relevance as there are technological alternatives to carrying out the tasks in their job description. Then a colleague asked a billion-dollar question that … Continue reading Has Technology Stolen our Jobs or Made New Ones?